As a power struggle ensues between traditionalist and pro-Thaksin factions, mass demonstrations throughout Bangkok may spark violent clashes and prompt a response from the military. Following months of polarizing mass protests and political violence, Thailand’s highest court recently ruled to remove embattled caretaker Prime Minister Yingluck Shinawatra from office over various charges of corruption. 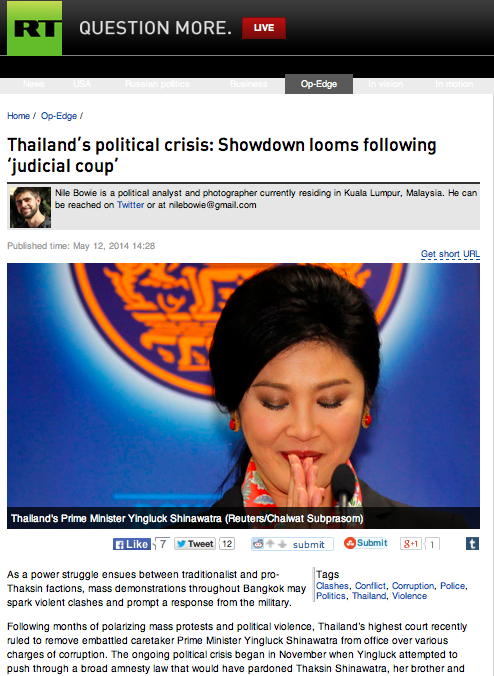 The ongoing political crisis began in November when Yingluck attempted to push through a broad amnesty law that would have pardoned Thaksin Shinawatra, her brother and former prime minister who faces criminal charges for corruption. Since that time, opposing protest movements representing the country’s two rival political factions that have clogged major roads in the country’s capital, Bangkok and occupied various public spaces around the city. Although the PM has been removed, Yingluck’s Pheu Thai Party remains technically in power with Deputy PM Niwattumrong Boonsongpaisan becoming the acting leader of the beleaguered caretaker government set to govern the country ahead of elections scheduled to take place on July 20. Suthep Thaugsuban, leader of the opposition People’s Democratic Reform Committee (PDRC), has rejected the appointment of Boonsongpaisan as caretaker prime minister, and has called on the country’s Senate, the Election Commission, and the Supreme Court to appoint a new interim prime minister — otherwise he threatened that his movement would unilaterally “do the job itself.” The PDRC further threatened to appoint an unelected “people’s government” if the caretaker government fails to resign, prompting thousands of Yingluck supporters to rally against the opposition.